*21 day advantage purchase is required. Other restrictions apply. Discounted one way fares from Hays to Denver are back! 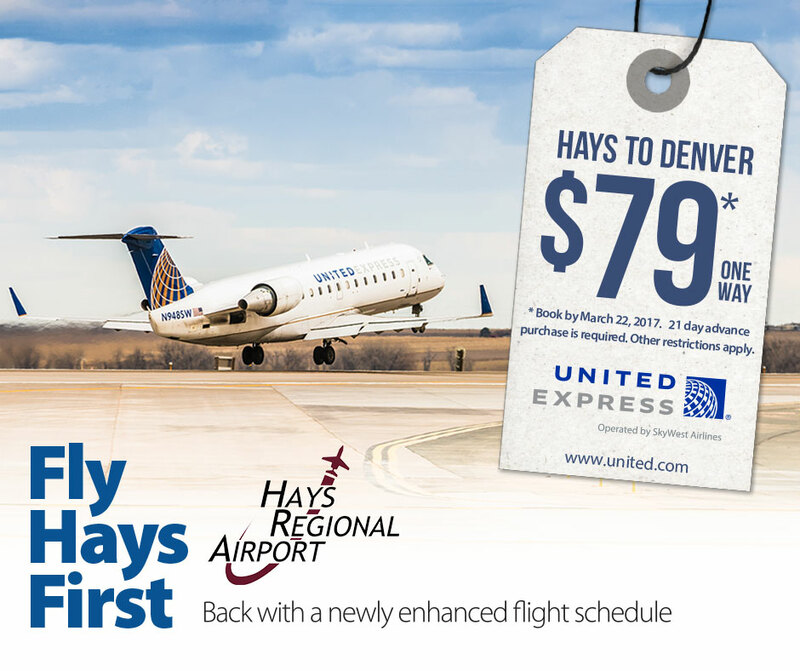 For a limited time, Hays travelers can book flights for $79 one way from Hays to Denver! But it won’t last long – this sale ends March 22, 2017. Book your next trip to Denver today at united.com, and enjoy Hays’ great flight schedule, now at a new low price! Restrictions apply. See Terms & Conditions below for details. The discounted fare displayed above is one way from Hays, Kansas to Denver, Colorado. Fare is available until March 22, 2017, for travel through November 15, 2017. Includes taxes and fees. Additional baggage charges, fees for other optional services, and restrictions may apply. Specific travel dates apply. Fare availability is capacity controlled. Fares may not be available on all days or on all flights. Fares are nonrefundable except during the first 24 hours after purchase and are subject to change at any time. 21 day advance purchase is required. Tickets | Tickets must be purchased at least 21 days prior to departure, but no later than March 22, 2017. Travel Period | Travel must be completed by November 15, 2017. Fare Validity | Fares shown are valid in the Economy (Coach) cabin on United/United Express carriers and certain codeshare operated flights only. Blackout Dates | Travel is not valid on May 13, 14, or 15, 2017. Miscellaneous | Fares, fees, rules, and offers are subject to change without notice. Seats are capacity-controlled and may not be available on all flights or days. Fares ore nonrefundable except during the first 24 hours after purchase. Other restrictions may apply. Flights between Hays, Kansas and Denver, Colorado are operated by SkyWest Airlines, doing business as United Express.